Surrounded by two arms of the River Ill, the Grande Ile (Big Island) is the historic centre of the Alsatian capital. It has an outstanding complex of monuments within a fairly small area. The cathedral, the four ancient churches and the Palais Rohan - former residence of the prince-bishops - far from appearing as isolated monuments, form a district that is characteristic of a medieval town and illustrates Strasbourg's evolution from the 15th to the 18th century. 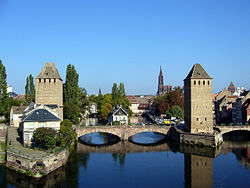 This article uses material from UNESCO World Heritage List article "Grande île (Strasbourg)", which is released under the Creative Commons Attribution-Share-Alike 3.0 IGO License.